The "shape point" in a position is the one that gives the good shape for one or both players. 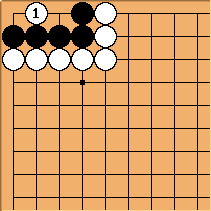 The term is usually used when denying the opponent his own shape point (e.g. grab the shape point in kikashi? ), as occupying one's own shape point is usually just called "making good shape." From left to right: the fourth point of a bamboo joint, the table point, the eye-stealing tesuji and the fourth point of a square? - aiming at a tower peep. Bob Myers: I wonder how this is different from vital point. I know the vital point page claims that that term is used for key life-and-death points, but that's wrong and should be fixed (has been now). Alex: I've always heard "vital point" used for the key point in life and death problems, so it's news to me that it's wrong. After all, the word "vital" does mean "necessary for life." If "vital point" is used for key shape points and some other term (what?) is used for the key point in life-and-death, I'd say the problem is with the translation. Personally, I like "vital point" for L&D and "shape point" for shape, since the words make it pretty clear what is being discussed. Rather than get into another terminology war, though, I'd suggest putting it all on one page, making "shape point" an alias for "vital point," saying that the terms are often used interchangeably although they really shouldn't be, and creating a discussion page for semantics wars. Of course, there's also the "pivot" or "focal point" for moyos, to confuse matters further. unkx80: My feeling is that "vital point" is probably a more general term than "shape point". Do you call the following "vital point" a "shape point"? Vital point in straight three. In this sense, above is not a vital point. It's just a basic nakade point. Vital point can be used in life-and-death contexts, but in the sense that seeing the vital point (shape point) can lead you to the correct solution--not as a trivial killing move. The reason vital point is more general than shape point is that the former can refer to points which are vital globally with respect to the overall flow of the game, whereas the latter is always local. unkx80: I see. If this is the case, then there is probably quite a bit of correction to do on the SL pages. Bill: I see no problem with calling a vital point. It's just that nakade is the preferred term for these situations.